I’m Marie Segares from Underground Crafter and scarves are some of my favorite crochet projects to make, wear, and give. When I first heard about the super scarf crochet pattern phenomenon, I knew I had to make one! After all, not only are Super Scarves luxuriously long and super cozy, they definitely make a statement! For my Super Scarf, I was inspired by the redwood, a species of super tall and long-lived trees that thrive in the Northern Coast of California. Like its namesake tree, this scarf is ultra long and it will definitely be noticed! 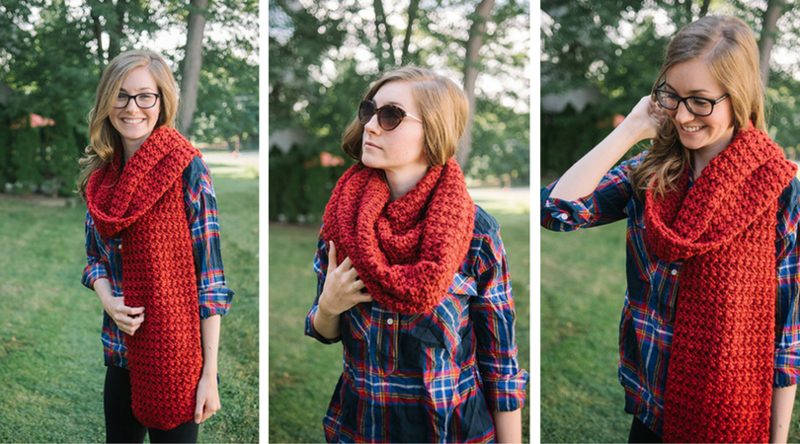 Make one for yourself or as a gift and get ready for cold weather ahead! This luxuriously long Super Scarf has a gentle, unisex texture. The simple stitch pattern is beginner-friendly. Adult: 9” (23 cm) wide x 87” (221 cm) long before blocking; 9.25” (23.5 cm) wide x 89” (226 cm) after blocking. Lion Brand Heartland Thick & Quick (100% acrylic, 5 oz/142 g, 125 yd/114 m) – 6 skeins in 113 Redwood, or approximately 750 yd (686 m) in any super bulky weight yarn. US Size M/N-13/9 mm crochet hook, or any size needed to obtain gauge. Optional: Blocking mat, pins, and spray bottle. 11 sts x 10 rows = 4” (10 cm) in pattern. Exact gauge is not critical for this pattern. Row 2: Turn, ch 1, sc in first st, *ch 1, sk 1 st, sc in next st; rep from * across. Row 3: Turn, ch 1, sc in first st, *sc in ch-1 sp, sc in next st; rep from * across. Row 4: Turn, ch 1, slstFL in first st, *hdc in next st, slstFL in next st; rep from * across. Row 5: Turn, ch 2 (counts as hdc, here and throughout), *slstBL in next st, hdc in next st; rep from * across. Rep Rows 4-5 until scarf measures approximately 85.5” (217 cm) long, or approximately 1.5” (4 cm) shorter than desired finished length, ending after either Row. Row 6: Turn, ch 1, sc in first st and ea st across. Optional: Spray block scarf to measurements if desired. 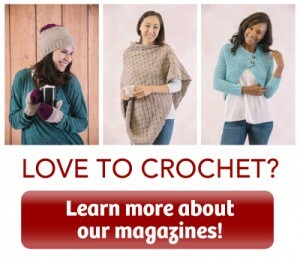 Now, head on over to the October issue of I Like Crochet to learn how to style your super scarf! You use the term slstBL in Row 5 but it is not in the abbreviations. Is this sl st in Back of loop? Beautiful scarf. You probably could! You would just have to crochet the ends together. Hope that helps! looks good I was wondering could you make this into a infinity scarf.